So, before I get started with my normal post, for the last couple months of this last year I have been pondering something. I had been thinking what would it be like to do a blog post once a week on a particular ingredient. Sure, thoughts of garlic, butter, chocolate, and more came to mind. I really thought about an ingredient that could be a little more transformational, and for me, this was cream cheese. Are you looking for a new way to prepare salmon? Salmon is such a wonderful protein to prepare. It can be cooked quickly. I often buy it frozen at Costco, I keep it in my freezer, and quickly defrost it when I want to make a quick meal at home. I love the individually frozen pieces of salmon at home. I defrost them by placing them in a sink of warm water submerged under a plate. This will generally defrost my salmon in about 20 minutes. Then it takes another 10 to 15 minutes to pan sear, and you will have dinner in no time. This recipe features a simple sauce made of cream cheese. This sauce is flavorful and quick and easy to make. You can turn ordinary salmon into something special in no time. Why cream cheese? For me, cream cheese is an ingredient you can pull out of your fridge and it helps to transform a dish. I think of ways I have used cream cheese in the past, it is a dessert with cheesecake, I have used it to thicken sauce with such as Alfredo sauce, and I have used it in one of my favorite dishes – cream cheese chicken. So I thought what if I forced myself to cook with a particular ingredient each week. So come take a journey with me, the journey of cream cheese, one of my favorite ingredients.You can try this pesto recipe if you want to make you own homemade pesto. Looking for another way to prepare salmon? Try my Baked Salmon, the marinade has just three ingredients. 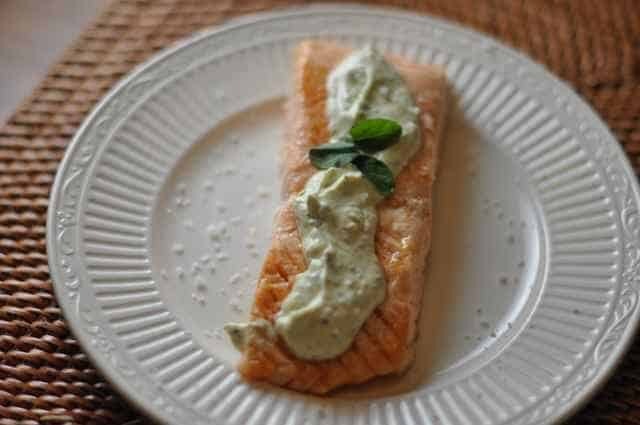 Enjoy pan-fried salmon with a savory cream cheese sauce. Bring salmon to room temperature about 15 minutes before cooking. Heat a large skillet with oil over medium-low heat. Season fish with salt and pepper, and place salmon skin side up in the pan. Cook until golden brown on one side, and flip over on the other side, this should take about 3 to 4 minutes on each side. In a small pot add half and half, pesto, and cream cheese, stir together well over low heat until the cream cheese sauce is combined well. Spoon about two tablespoons of the pesto cream cheese sauce over the salmon. You may want to serve with a lemon slice along with the fish. Could maybe use a good quality plain Greek yogurt instead of the cream sheese? Royce, I didn’t try making the recipe this way, but I bet it could work. thank you and love the idea of a featured product ingredient….I’ve been trying get a handle on garlic. Here’s the thing..Macaroni Grill serves the best ever spinach salad with roasted garlic or pan fried? I’ve debated whether to learn to make this salad myself. I’ve already tackled the incrusted goat cheese part. Why debate you ask? My hubby “King” will announce; now I won’t need to take you there again. So sad!